Do you long for friendships that last longer than life itself? Friends you can count on for anything. Friends who show up no matter how hard or busy your lives are, no matter what kind of suffering any of you are going through? 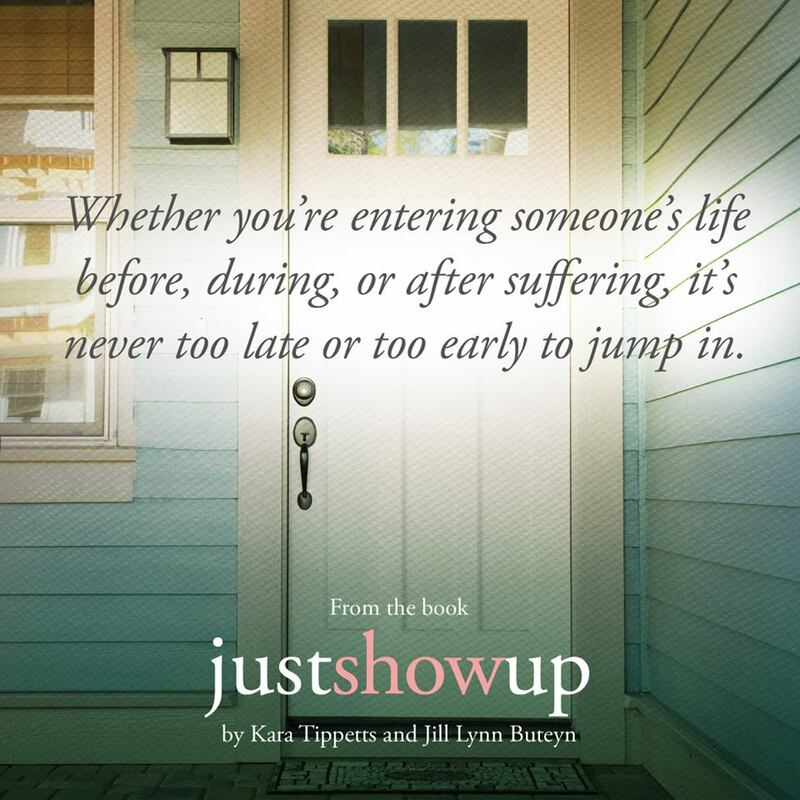 During her lifetime, Kara Tippetts cultivated her community carefully.She and another member of that community, Jill Lynn Buteyn, teamed up to write about what sharing life with someone going through suffering looks like in the flesh. Kara Tippetts’ suffering was not an easy road. Not for her, her family, or those friends who love her. Her journey with cancer was chronicled on her blog, Mundane Faithfulness, and the blog only expanded her community. In the book, Buteyn carries the burden of explaining what showing up in suffering looks like and Tippetts offers her own insights at the end of the chapter. 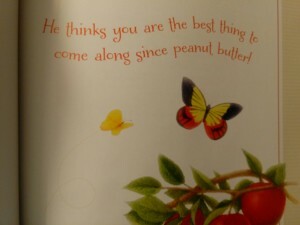 This book was hard to read. There is sadness and sorrow in sharing, as Tippetts calls it, the hard in someone’s life. We want to be able to fix the problem, to offer answers. But that’s not always what God calls us to. Sometimes all our loved one needs is someone to run to the store for them, to do a load or two of laundry for her family, or to simply sit and be still. After reading this book, I long for a community like this, and now I have a blueprint as how to make it happen. Kara Tippetts loved those around her with a big love. A love that will touch lives well into eternity in heaven as her community rejoicing in seeing her whole and healthy again. If you know someone who is suffering, if you’re suffering yourself, or if you just long for lasting and meaningful friendships, this book is a resource filled with practical and specific insights, observations, and suggestions. Just be sure and leave the tissue box near! ***David C. Cook and Family Christian provided me with a complimentary copy of this book in exchange for an honest and fair review. All opinions expressed are my own. Personally, I’m not someone who watches the news—or news channels, for that matter. Most of my news comes from the short emails from CNN in my email inbox. If it’s a story that interests me, I’ll read it. Otherwise, I’ll ignore it. 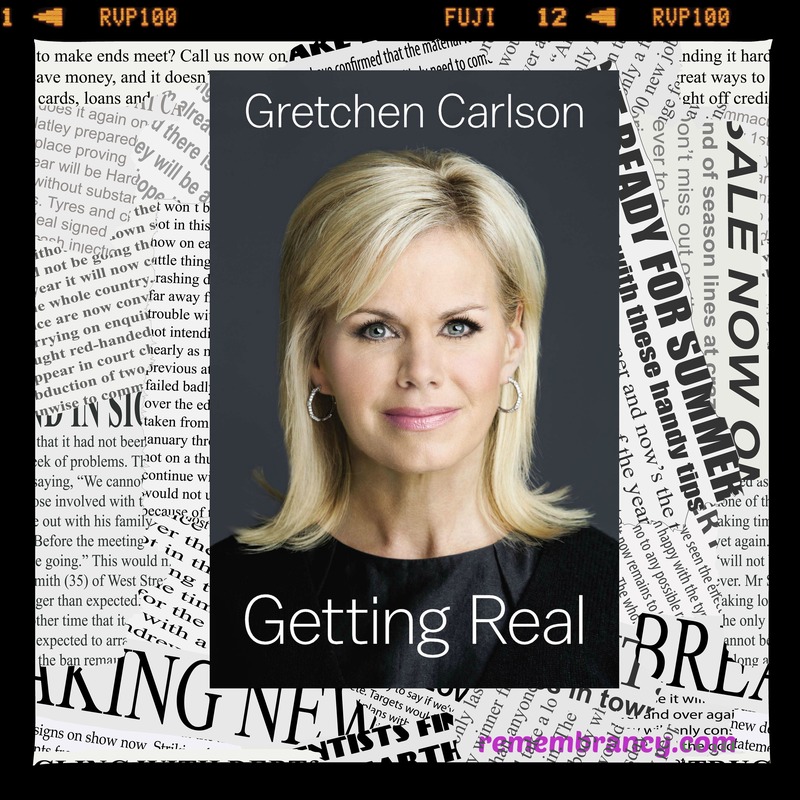 So when I agreed to review Getting Real, I had no idea who Gretchen Carlson was (sorry Miss America pageant and Fox News). Carlson details her life from childhood to present day—and it’s fascinating. Most people haven’t lived the life she did (most people, if proficient at anything, or only proficient at one thing). As a child, Carlson played violin well enough to play with professionals including orchestras and at music festivals. Her childhood was filled with practicing and recitals, not with makeup and sleepovers. She decided to give up a promising career as a violinist and pursue other dreams. When she set her sights on becoming Miss America, it became her only focus. She dieted, practiced, shopped, and studied everything about winning the pageant. And in 1989, she succeeded. After a year of speaking engagements and appearances, Carlson returned to Stanford to finish school with her sights set on her next goal—broadcast journalism. She had to fight to get to where she is today (her own show on Fox News) but when Carlson decides to do something, she goes for it without looking back. It was fascinating to read about Carlson’s life—the struggles, the misconceptions and prejudices toward her because she is a woman, a former Miss America, or a blonde, and the people who came alongside her to encourage and grow her. She has opinions and is not afraid to share them with others. There was a mention in the first chapter about people giving her grief about sharing her faith, but I was almost to the end of the book before she mentioned her faith again (other than her grandfather being a Lutheran minister and his church). In the book, she shared a lot of hard things she had to deal with over the course of her life, but she never talked about her relationship with Christ or how he helped her through those things. More often than not, it was her pushing herself to the outcome she wanted. This fact bothered me a little bit as (at least to me) it’s more important to live your faith than to profess it. Yes, she does have a high profile and is in a great position to stand up for Christianity, but I would have liked to hear at least once in the book (perhaps with the medical scare for her daughter) that she turned to God to make it through that time. The story that touched me the most out of the whole book was the one about her daughter and her heart toward two little girls who lost their lives in the Sandy Hook shooting. This little girl is definitely living like Jesus would. That said, Carlson seems to be a wonderful role model for women—standing up for women in the work place, balancing both a career and a family, asking the tough questions—and a woman who speaks her mind when it comes to the increasing intolerance in America toward Christianity and Christian beliefs. If you’re a fan of Carlson or maybe just want to get to know her better, this book will definitely show you the real woman. Family Christian is offering a $25.00 Customer Appreciation Certificate to one lucky reader of this blog. To enter, do one (or all) of the following below. Anna Konig is not excited about the voyage to the New World. She doesn’t want to leave her grandparents, her home, and everything familiar, but as the only person in her small Amish church who speaks English, she feels it is her duty to accompany the group as translator. Her plans are to return home as soon as possible. Bairn is the Charming Nancy’s carpenter (third in charge after the captain and the first mate). He doesn’t know what to think of the Peculiars who are passengers on the ship. Why is he so drawn to young Anna? They have nothing in common. Or do they? Will Bairn discover the truth too late? As a person who loves to read almost any type of fiction (contemporary, historical, suspense, romantic suspense, mystery, etc), the one genre I tend to steer clear of is Amish fiction. I am so glad I read this book. It was hard to put down when it was time for bed or time to go to work. I kept waiting for the main characters to figure out what I had already put together (and no, I’m not going to spoil it by telling you what that is right now). Anna is unsure of herself in a few areas but that doesn’t keep her from trying her best and caring for her people as well as others, even her enemies at times. Bairn has had a difficult past and readers will sympathize with his struggles as he comes to terms with the truth of who he is, where he’s from, and his relationship with God. 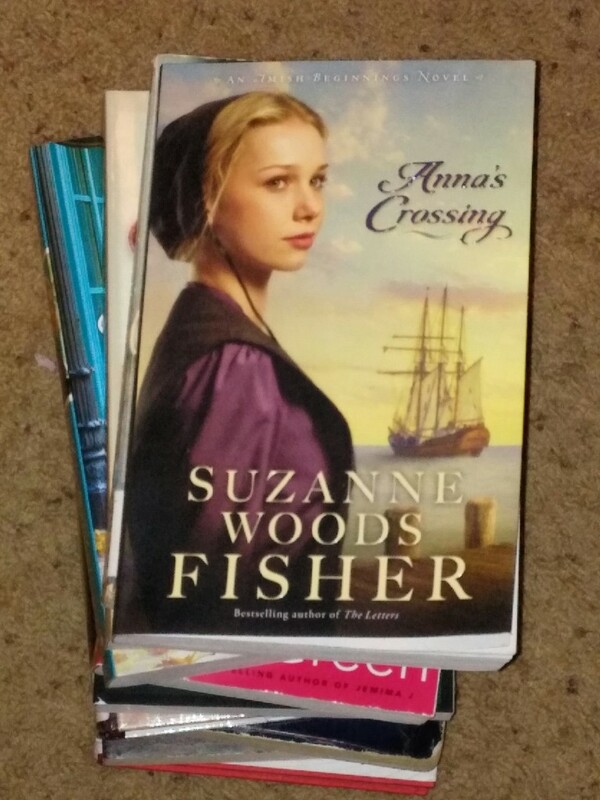 Suzanne Woods Fisher’s descriptions put you right in the middle of life on the boat as the group makes their way from Germany to England and then on to America. 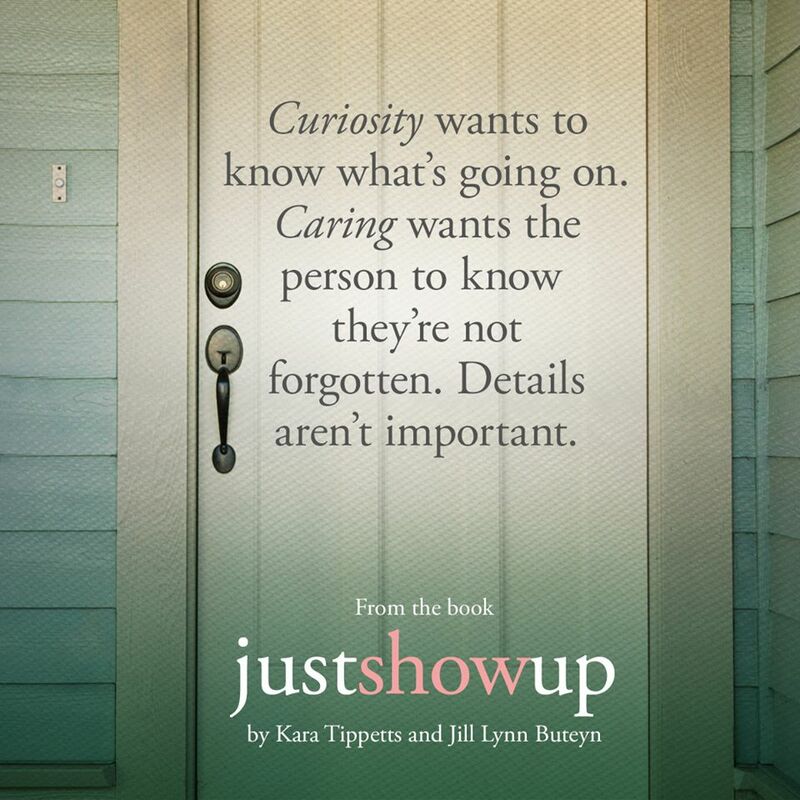 Perhaps you or someone you know would enjoy this book. Enter now to win a $25.00 Customer Appreciation Certificate courtesy of Family Christian. Life is expensive. Wouldn’t it be wonderful if we could find ways to make it less expensive? Oh, I know what you’re thinking. “I don’t have time to clip coupons” or “I don’t want to give up my (fill in the blank).” One of the top New Years resolutions people make every year is to get out of debt. The people who are successful are those who take time to plan, the people who live within their income instead of exceeding it every month. There are so many places people can cut expenses. Some you may have heard of (clipping coupons, doing away with credit cards) and some you may have never thought of (all of those excessive charges on your cell phone bill). 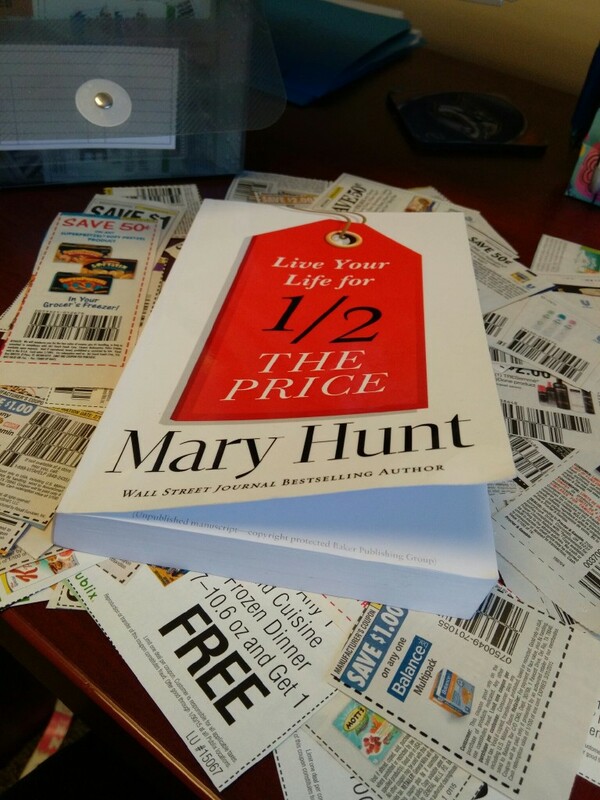 In Live Your Life for Half the Price, Mary Hunt provides strategies for reducing your debt and spending less. From grocery shopping tips (yes, coupon clipping is involved but her suggestions and helps will keep it from becoming tedious) to saving on insurance, from cleaning out your closet and building a basic wardrobe to car buying tips, Hunt offers solid advise on how to trim your cost of living. Hunt offers readers many tools to make cutting your expenses easy (websites, phone numbers, books, recipes, and more). In addition to her suggestions, she tells her own stories. She has been where you may be now. She and her husband struggled with credit card debt, and she now makes a living helping people get out of debt. Readers don’t feel like they’re alone in their struggle to bring their expenditures within their income (Hunt suggests living on 80% of your income, giving away 10%, and saving 10%). <em>Live Your Life for Half the Price has sound advice for anyone wanting to reduce what they are spending. You may not want to drive that old clunker another year, but what’s more important to you, driving the newest model car or providing your children, spouse, parents, etc with a future that isn’t clouded with debt? Found money is always nice so Family Christian is offering one lucky person a $25.00 Customer Appreciation Certificate. 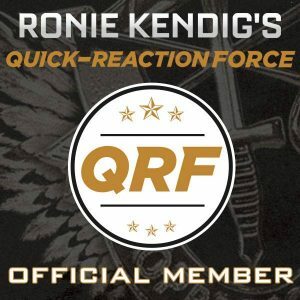 Use this in stores or online. You can purchase this book to help get you started on making a plan for getting out of debt or perhaps you need a gift for something that has come up unexpectedly. Enter for your chance to win. Family Christian provided me with a copy of this book in exchange for an honest review. All opinions expressed are my own. Since January, I’ve noticed a common theme running through several sites. Let me give you just two examples of that. Family Christian’s book of the year is Max Lucado’s Before Amen. Author Robin Lee Hatcher announced on her blog at the beginning of the year that her word for 2015 is Persistent Prayer. 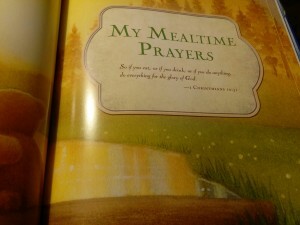 Prayers is often something that becomes rote, something we do at meals or before bedtime with our children. What if we became more committed to prayer? What if we taught our children to pray continuously? How much different would our world be with more prayer warriors? 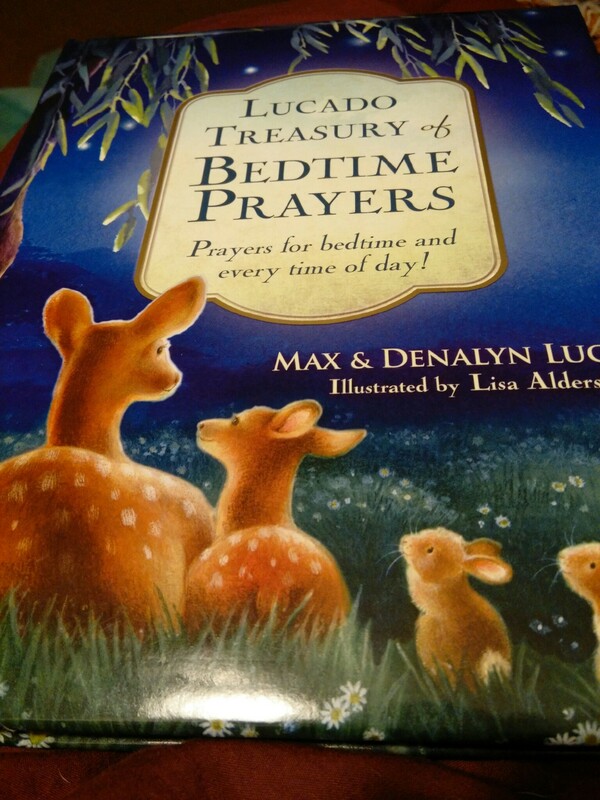 In Lucado Treasury of Bedtime Prayers, Max and Denalyn Lucado provide a book full of prayers for children. Parents, teach them young and they will build a lifelong habit. This beautifully illustrated book begins with a letter to parents, a plea to teach children to pray. The Lucados encourage parents to read the book with their children, memorize their favorites, and recite them often. The prayers of others are as important as our own. Don’t let the title fool you. This book is full of morning prayers, prayers of thanks, playtime prayers, and more. A collection of time-tested prayers that have been adapted, scripture verses, and new prayers written by the Lucadoes that flow like nursery rhymes (the flow and rhythm make them east to memorize). If you’re looking for something special to share with your children or grandchildren, this would be a wonder family activity. The book would also make a beautiful gift for expecting parents (perhaps you’ve got a baby shower ahead and need a thoughtful gift). Sunday school teachers who have a student who might not have a spiritual mentor might consider passing this along as a way to teach a child to pray. 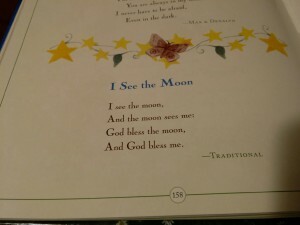 Would you like your own copy of Lucado Treasury of Bedtime Prayers? Enter to win a $10 Customer Appreciation Certificate from Family Christian to use toward your copy of this wonderful book.